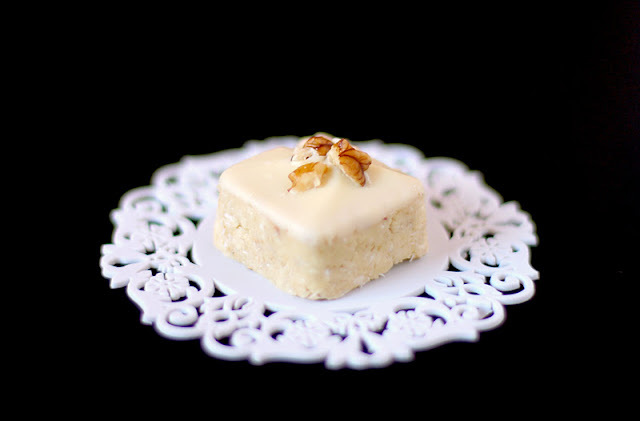 you know, cube-ish like petit fours. And they're sweet and rich, also like petit fours. They actually taste like fudge--chewy, coconutty fudge. and they also taste like cookie dough--soft, coconutty cookie dough. 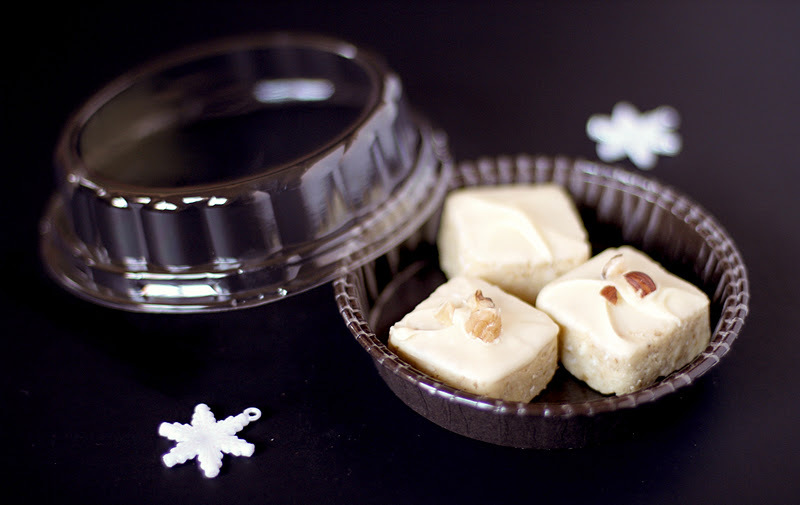 This "fudge-meets-cookie-dough" hybrid is totally delicious on its own, but after it has been dipped in some white chocolate (oh my) it becomes the most creamy, sweet, decadent and divine gift of all. Yum, yum, yum . . . yum, yum, yum! It was calling my name! And then it ... stopped calling. What can I say? I'm a taste-tester too! 1. Blend the oats into a flour and pour into a large bowl along with the rest of the dry ingredients and whisk. 2. Warm the brown rice syrup, honey and coconut butter in the microwave at 10-second intervals, stirring between each one, until runny. Stir in the vanilla paste and extracts. 4. Cover your fingers with plastic wrap or a plastic bag and press the mixture into a mold of your choice--I used one with 24 individual, 1" cubes (the mixture filled 18). If you don't have a mold like this, line a brownie pan with parchment paper and flatten the mixture with a pastry roller or your plastic-wrapped hands until flat and even. 5. If using a mold, place in the freezer for 30 minutes. If using a brownie pan, refrigerate for an hour. 6. While you wait, melt the white chocolate. Microwave at 30-second intervals, stirring between each one, until melted. 7. 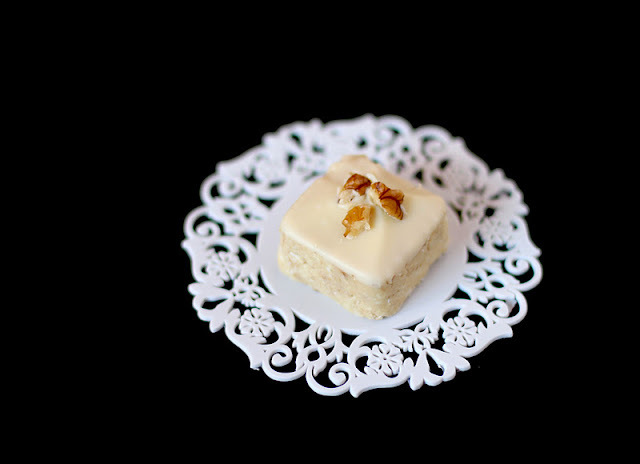 Pop the petit fours out onto a plate. If using a brownie pan, remove the parchment paper from the pan and slice into cubes of desired size. Dip one face of the petit four into the white chocolate and let it firm on a piece of parchment paper. Refrigerate for at least 30 minutes and serve. I am sensing that these will be made again in the near future! Aka, next week. These look pretty good. Do you think it would be alright to use vanilla extract instead of vanilla paste? 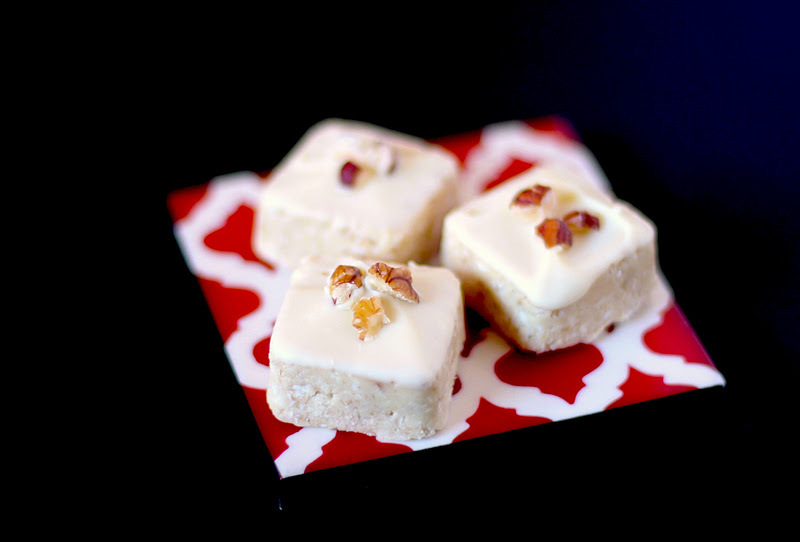 You had me at "they taste like fudge" - they are so beautiful and sound absolutely delicious! Those look amazing!!! You can't go wrong with a cross between cookie dough and fudge. The butter extract I have says it contains milk, but I guess there are vegan butter extracts out there. So, vegans, you're in luck! These looks lovely. Can't wait to try them out. Read your nutrition section and am definitely going to give your recipes a try, not that I needed further convincing after I saw the pictures! Vegan heaven.